The Pub Outing – Squawker and Nona. Today, Mary and I went up to Evanston for our annual “Pub Outing and Peregrine Watch”. Yay! We arrived in Evanston at around 10:30am. Immediately, we spotted an adult sitting on the crossbeam above the nest, so we hustled into the library to see if we could get a good look at its bands from the second floor window. As I’ve mentioned here and there, the faithful little Panasonic camera that had been my constant companion throughout peregrine seasons past died over the winter. We replaced it with a Canon 40d and added a very nice 70-200mm lens to the package. I am forever grateful for the Panasonic, as it was the perfect tool on which to learn the ins and outs of digital photography. However, the Canon is light years better, though it requires much more skill to operate effectively and is MUCH less low profile. That said, I have to admit I felt exquisitely conspicuous as I eased the Canon out of its bag and started clicking pictures of the Evanston adult. Mary sat in front of me, peering up through the window with her binoculars. I stopped clicking and brought the pictures up on the view screen, zooming them up as far as I could to see if I’d gotten a leg band. To my dismay, the pictures seemed a bit murky. This is not surprising, as the situation is a bit odd for photography – taking pictures from a brightly lit interior through the deeply tinted, polarized glass of the windows. Mary giggled. I’m a font of this kind of odd information, most of it not remotely helpful. It sticks in my brain like lint in a trap. The adult began to preen and I readied my camera again. At one point in the session, it held out a banded leg long enough to get a semi good look (my friend John says it looks like the peregrine is checking its watch). 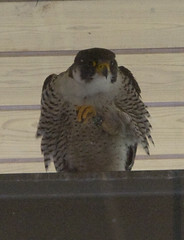 The other adult careened into the nest and we lost our view, as both dropped out of sight, probably to feed the chicks. We packed our things and went outside. Time for pub lunch! By the time we got outside, the female was back up on the crossbeam and the male was across the street on the roof of a building. We selected a table that allowed us the best view of the nesting site and then settled in for a pint of beer and lunch. When Mary’s Guinness and my Bass arrived, we clinked glasses. For the next hour and a half, we concentrated our efforts on getting the male’s bands, but he stayed fairly far away, so we couldn’t see much. A time or two, we focussed the scope and binocs back across the street at the female, who was mostly snoozing on the crossbeam. “Of course, I can see HER bands as clear as a bell! Black over green, 64 over D. I am 90% sure that’s “Nona”, the female from last year,” I said. On our way back to the museum, full and happy, we agreed the only thing that would have made the day better is if we’d gotten the male’s bands. “Well, I’ll come up to the banding and try to get the male’s bands while you guys have the chicks inside,” I said. Later that night, I downloaded the pictures from our Canon. I managed to get one shot that, though grainy, had a clear enough view of the bands – black over green, 48 over M.
This is funny. As it turns out, it was the MALE, Squawker (same as last year), that was sitting on the crossbeam over the nest as Mary and I sat inside the library. While we packed up and walked downstairs, the male and female apparently traded places. By the time we sat down at the pub, Nona was sitting in the same place and same position as Squawker had been, so we assumed it was the same bird and concentrated our efforts on getting the male’s bands, which we unknowingly already had. Fortunately, we both took a few glances at the female and though we didn’t get a leg band picture, we both saw the numbers clearly. So, I guess I won’t be going to the Evanston banding this year and can mark that task off the to-do list! ~ by Steph on May 20, 2008.